Hippolyte-Camille Delpy, (French, 1842-1910). 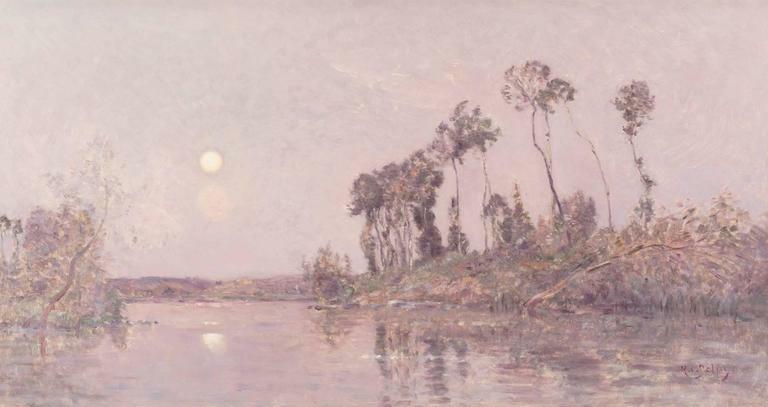 A wooded river landscape at Dusk. Oil on panel. 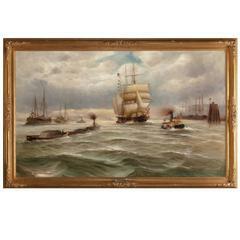 Measures: 16 x 29-1/2 inches (40.6 x 74.9 cm). Signed lower right: H.C. Delpy. Framed dimensions: 22.5 x 36 x 2 inches. Hippolyte Camille Delpy (born 1842-died 1910) was a painter from France. Delpy came from a moderately wealthy family from Joigny, in the Burgundy region of France. He was a student of Charles-François Daubigny. 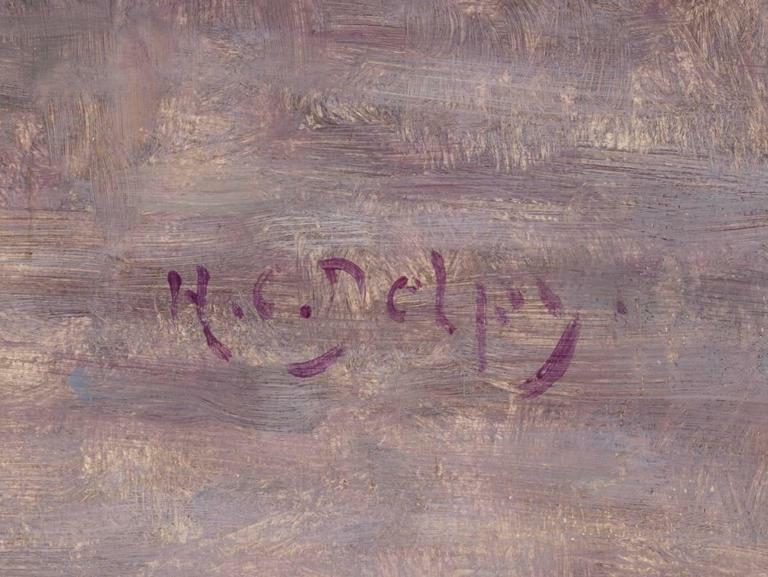 Hippolyte-Camille Delpy studied with Charles-François Daubigny as well as Corot. A contemporary of the Impressionists, Delpy blended the subject matter that he adopted from Daubigny with the brighter colors and looser paint handling that were trademarks of his own generation to create distinctive new visions of many of the landscapes first explored by the Barbizon and Impressionist artists. In the early 1870s, Delpy worked often in Ville-d'Avray, Corot's favored country site, and in Auvers-sur-Oise where Daubigny lived. Delpy began friendships with Pissarro and Cézanne who shared his admiration of Daubigny. 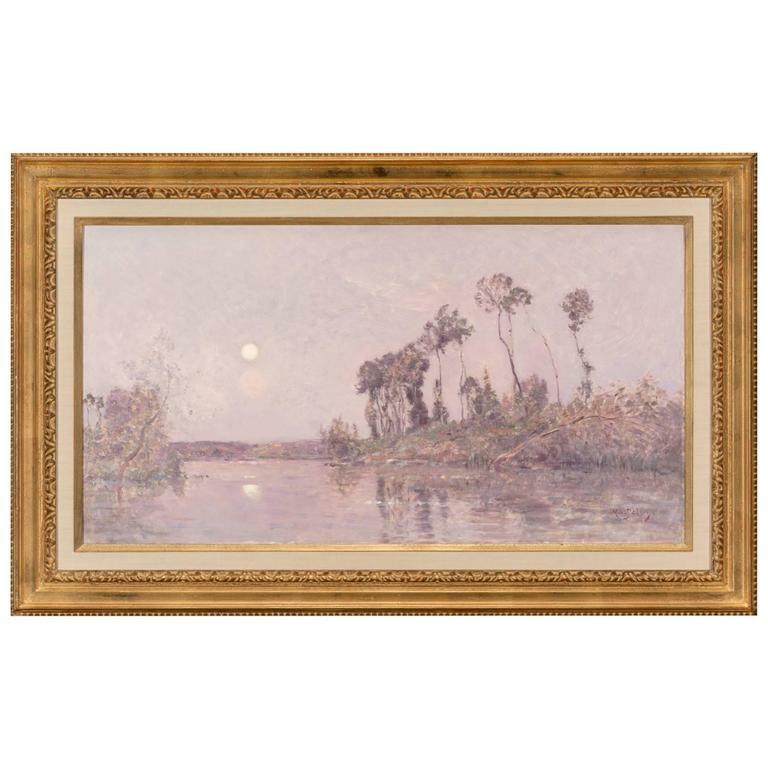 Art Nouveau goauche painting of a landscape by Gaston Noury, born in Elbeuf in France in 1866. Framed.